Kneipp is based on five essential pillars that epitomize the company's ideals. By combining the benefits of water, plants, exercise, nutrition and a healthy balance, we are able to achieve healthier and more fruitful lives. 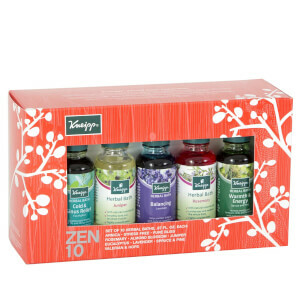 If you love indulging in rich, aromatic baths, but you don't want to have to settle for just one scent, try the Kneipp Zen with 10 herbal bath collection 10-pack. Each one has a unique and fragrant aroma to either calm, invigorate, balance or harmonize your body and senses, while soothing and healing dry, tired skin. Boost relaxation and steep away stress with Kneipp Herbal Bath - Eucalyptus. It will leave your skin softer and smoother, while your senses are invigorated, cleared and uplifted. The natural plant oil combines with the warm bathwater to unlock the combined essential healing powers of water and nature. In the late 19th century, Sebastian Kneipp designed a way of life known simply as "naturopathic," combining the best of natural plants and essential oils. Blending the ideas of ancient Greek and Roman bathing rituals, natural cures from the Far East and European medicine, Kneipp created a way to treat everything from dry, dehydrated skin to eczema and psoriasis. Today, the Kneipp Group still focuses on natural health and develops products to meet the holistic needs of consumers.